In this post I'm only going to show you swatch, color description, and the quality (opaqueness) of the product, for the basics of the product (price, quantity, cruelty-free or not, etc) go HERE. 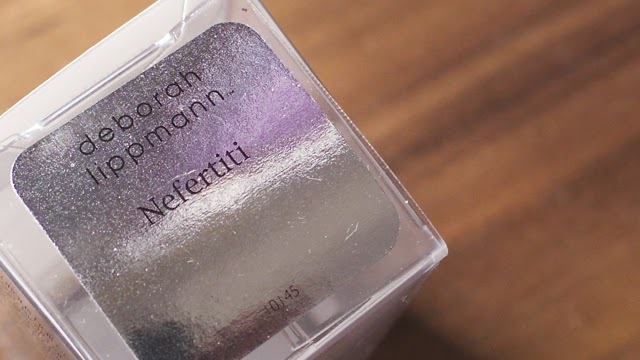 I'm back with the Deborah Lippman individual nail polish review as promised, albeit a day late hehe. The plan was to wake up last night at 10ish (for some reason I do everything better when it's night time and dark outside. Ikr?) because I slept immediately after I got home, but I slept through the night lol. Anyway, feels refreshed now, so let's get this review going.. I'd say it's a very suitable name seeing as it's a gold nail polish and in my head ancient Egypt colour palette are gold and blue. You can get to its full opacity with just 2 coats, but I always like to add an additional coat just to be sure (It's the OCD in me I think). Light/pale gold with silver flecks throughout. 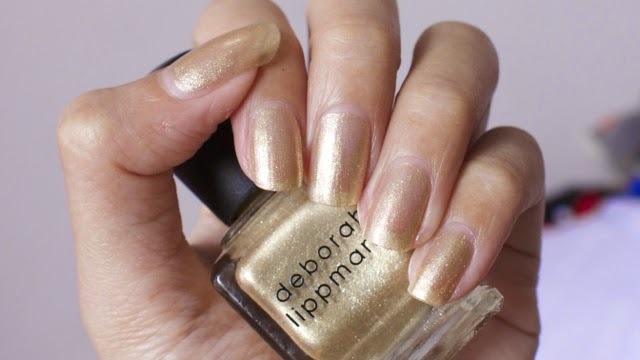 It's hard for me to find a gold nail polish that's wearable on its own as a lot of gold nail polishes are too harsh and clash with my skin tone and basically just looks "cheap and cheesy" a.k.a norak, so I love how the gold in this nail polish is not too yellow so it suits most skin tone perfectly. The gold is not too in your face either -thanks to the silver flecks-, so I can see this to be worn on a day-to-day basis when you want a little glam. It has a nice foil metallic finish with a hint of multi-color shimmer (the multicolour shimmer is very subtle, so on a viewing distance it can't really be seen). For the most part the formula of this nail polish is a dream to work with, it's a nice "liquidy" consistency that allows for a thin and even application, doesn't leave noticeable brush strokes for a metallic nail polish, and dries quite fast, but since it dries quite fast, when I apply a layer of nail polish and still finishing up applying that layer it has became semi-dry and I ended up dragging the nail polish layer and kinda left with a bit of clumps on the tip of my nail. Does my explanation make any sense?lol. Just apply this nail polish quickly without going back and forth with the brush stroke per layer and you'll be fine. The weird thing is, even though it dries fast, it never really fully dried. What I mean by this is, you know how when a nail polish has dried you can do whatever you want to your nails and it wouldn't make a dent on the nail polish? Well, with this, even after a day, if push your nails with your other nail (?) -like scratching- really hard you'll still be able to make a noticeable dent on your nails. Again, does my explanation make any sense whatsoever?lol. Basically, it dries fast, so not long after you finish applying it you can do whatever you want, but you can never scratch your nails really hard or it will make a dent, or just do a 2 coats and it's fine, even simpler, put on a topcoat. Overall, it's still one of the best, if not the best, subtle-wearable gold nail polish that I own, so there's that, and other than that weird thing, the formula is great. Click HERE for the direct link to this nail polish on Luxola. Use the code "LILY25" to get 25% off any of your first-time purchase there (code valid in Indonesia Luxola, so you need to change the country to Indonesia -IDR- on the top right corner, but you can change the shipping to your country on check out, shipping cost won't be any different). This really looks like gold foil, doesn't it? It's super pretty, and very wearable.